Provide comfort for the family of Gary Hamer with a meaningful gesture of sympathy. 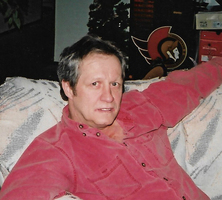 It is with profound sadness that we announce the passing of Gary Brian Hamer, 63, of Calgary, Alberta. He was born to parents Evelyn and Keith, on May 18th, 1955 in Westlock, Alberta. Gary is survived by his daughter Kari (Nigel) and grandchildren Chris, Amber and Jaxon, son Cam (Kristy) and granddaughter Taylor, siblings Elaine (Ted) of Parksville, BC, Bernie Hamer of Hinton, Alberta, Robert (Carol) Hamer of St Albert, Alberta, Jamey (Susan) Hamer of Stony Plain, Alberta, Alfred (Cindy) of Ft McMurray, Alberta, and numerous neices and nephews. He was predeceased by his very beloved mother Evelyn, father Keith, sister Sharon Clark, brother in-laws Vern Clark, Morley McCallum, and sister in-law Brenda Hamer. Gary loved to laugh and loved a good story. He really liked to BS and could have sunk a boat with his stories. There was never a dull moment with Gary in the room. He will be greatly missed by all that knew and loved him. To view and share photos, condolences and stories of Gary please visit www.choicememorial.com. Arrangements entrusted to the care of Choice Memorial Cremation & Funeral Services (403) 277-7343. Provide comfort for the family of Gary Brian Hamer by sending flowers.